This year Skirting Science took place at Broadoak Academy, Weston-super-Mare on June 23rd. The opening speaker was Lucy Ackland who spoke inspirationally about her career as an engineer. She had left school at 16 to work for Renishaw engineering and 8 years later had a first class degree in mechanical engineering. She was made Young Woman Engineer of the year in 2014 and is an eloquent ambassador for her profession. There were 13 workshops on topics ranging from flood defences to blood constituents, from smart plastics to genetics (see programme). Over 150 girls attended, each participating hands-on in 3 of the hour-long workshops over the day. The day was also attended by the Mayor and Mayoress of Weston-super-Mare, Cllr and Mrs Alan Peak and Soroptimists from around the South West and Wales. Skirting Science was initiated in 2009 by Soroptimist International of Weston-super-Mare. It is an annual one-day event which brings together workshop providers from academia and industry and secondary school girls from North Somerset and Bristol. It aims to encourage girls’ interest in science by demonstrating how varied, fascinating and all-encompassing is science in all its manifestations and through its many different career opportunities. It tries to dispel the perception that science is for boys rather than girls. Skirting Science has been hosted by Broadoak for 4 years and Soroptimists are most grateful for their hospitality and cooperation. 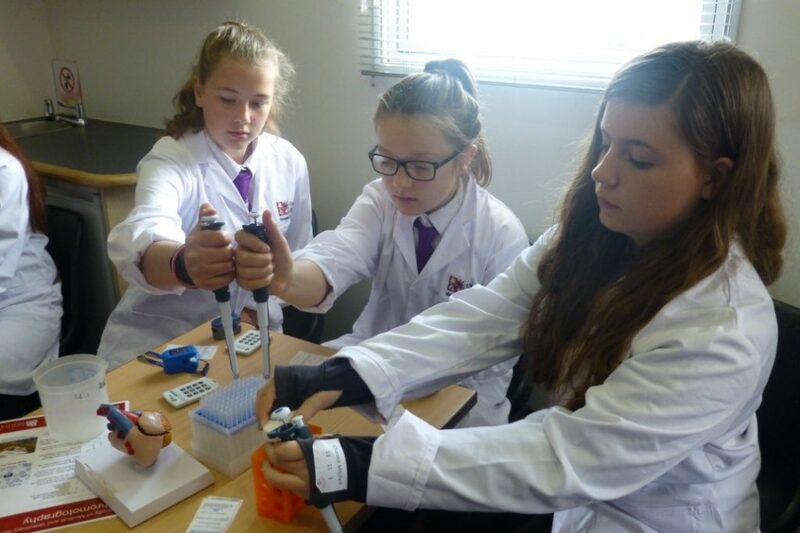 On 28th June 250 girls from fifteen schools attended Skirting Science; an action packed day of Science and engineering held at Churchill Academy. Skirting Science at the United Nations!